Beneficial Ownership in International Tax Law compares the use and interpretation of beneficial ownership, both current and historical, in a wide range of national jurisdictions and the EU. In International Tax Law, the term ‘beneficial ownership’ refers to which parties involved in a cross-border transaction are entitled to tax treaty benefits. However, determining beneficial ownership is a complex and often disputed issue, subject to different meanings in different countries. Archival research on its early use in tax treaties and in the developing OECD Model reveals that its meaning has changed dramatically over the decades, leading to new interpretations significantly affecting current tax practice and scholarship. This is a book dedicated to establishing how beneficial ownership should ideally be interpreted ultimately shedding a clearer light than has heretofore been available on the meaning of the term. the role of agents, nominees and conduit companies. Specific analysis of the use and interpretation of beneficial ownership in the context of a domestic law and treaty in numerous jurisdictions – with particular emphasis on the United Kingdom, Australia, the United States and Germany – is a major feature of the presentation. Furthermore, a comprehensive coverage of how the concept of beneficial ownership has developed over the past half-century is discussed. 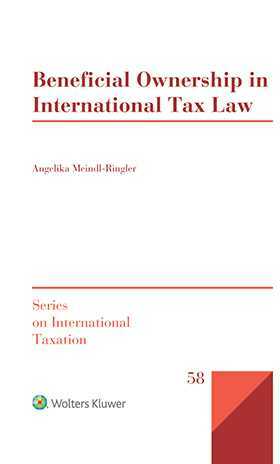 This book provides thorough guidance in determining whether a person claiming tax treaty benefits is the true owner – and which parties are excluded from treaty benefits and to what extent. This book helps in developing a logical, easy-to-apply practical approach to beneficial ownership. Highlights of complex issues and important jurisdictional differences in the interpretation of beneficial ownership ensure an in-depth understanding of the concept of beneficial ownership, which serves to be of immeasurable value to lawyers, tax authorities, policymakers and other professionals working with taxable international transactions of any kind. CHAPTER 6 A Domestic Law Meaning of Beneficial Ownership? CHAPTER 10 How Should Beneficial Ownership Ideally Be Interpreted? CHAPTER 11 Conclusion: Back to the Roots!